Last week I was grading my 12 year old’s Latin exercise. Now, before you think, “Wow! Latin?” let me just tell you that he has a wonderful tutor, I use the answer key to check his work and usually ask him if it is really wrong or not. I know very little about Latin, but am slowly learning as we homeschool with Classical Conversations. Anyway, as I am checking his work, he comes over and points to the bottom of the page. There, tucked away on the corner of his paper are the words: fidēs grātia. He says to me, “Mom, do you know what that means?” Of course my answer is no because of how much Latin I don’t know, remember? He looks at me, as he smiles and says, “It means: A Faithful Influence.” I smile back and I realize…Someone has been watching me. As I have stepped out in faith and have begun this blogging/writing journey, my son has watched, listened, and knows I’m doing something important. That just really struck me. My obedience has made an impression on my son. As I have set out to be a “faithful influence”, and teach others what I have learned, I am inherently influencing the people the closest to me, including my own children. Everyone has a different and unique calling. Sometimes that calling seems like it has nothing to do with our family and friends. Sometimes it is directly related. But either way, people are watching you. There are byproducts that come from our obedience that just sweeten the deal and a lot of times we don’t even know they happened. There are weeks that I sit here and write the words that God has placed on my heart, I click “publish,” and I wonder…did I make a difference? But you know what? The answer is “yes” simply because I obeyed. I became vulnerable and even though I might not hear what people thought of my words, something did happen that is even more precious to me. I caught the attention of my son. If you are feeling like you are taking steps forward and nothing is happening, if you are just doing the next thing because it is all you can do, or if you are wondering how you are making a difference, it all boils down to this…be sure you are living each moment in surrender to Jesus. As we lay down our will and live out His, He works in ways we may never see. 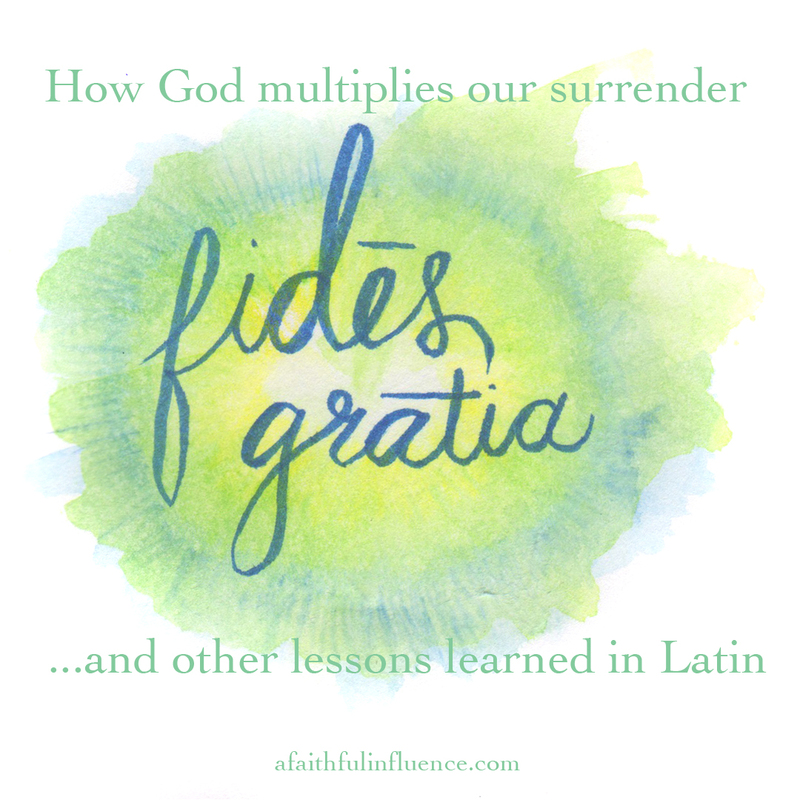 But once in a while, He gives us a glimpse of how our surrender has produced offshoots of growth in areas that we had no idea a seed had even been planted…like in a son in Latin class.